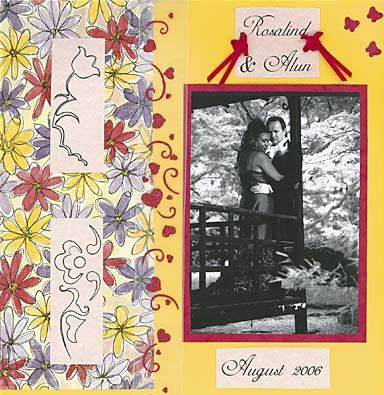 My wedding scrapbook was a very personal gift for my wife, which got me into this scrapbooking thing before I realised it wasn't a guy thing. Too late! My favourite 'classy' font is 'Adine Kirnberg' by David Rakowski, which I used again for this layout, printed on pink vellum. I also used pink vellum and a black journaling pen for the flower stencils. The ribbon is from Essential Craft, and I cut the butterflies with a Craft Planet punch. Most people would opt for white, ivory or maybe silver, although I bought a deep red Papermania 12 x 12 album. 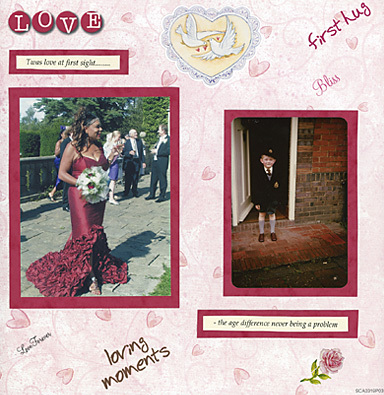 I like the small square window on the front cover where you can place a special photo or illustration. Your local scrap shop will have a selection but nothing like the enormous range available on the web. If you don't mind not 'feeling the quality' before you buy, just 'google' wedding scrapbook albums and you'll be fine. WHAT TO INCLUDE IN YOUR SCRAPBOOK? I wish you all the best with your scrapbook. It will be looked at more frequently than your professionally-made album. Take my word for it!